I work at the Belmont Business Improvement District (BID) as a part of my Coverdell Fellowship for the Fordham IPED program. The mission of the Belmont BID “is to promote and expand the economic well-being of the business community, and the community at large, by promotion of the “Little Italy in the Bronx” brand, our strong ethnic heritage and leadership in the culinary marketplace, and by leveraging the mercantile, social, political, and cultural assets within and around or community.” My daily tasks as an intern at the Belmont BID vary, but typically my work includes website management, interacting with local business owners, planning community events, and conducting administrative responsibilities. Additionally, I research the neighborhood and gather information on the happenings in the area. 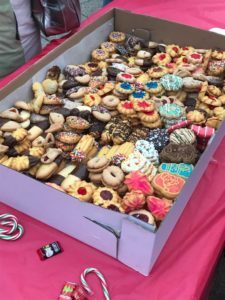 “Little Italy in the Bronx” attracts people from all over the world, and the Belmont BID works hard to promote the area and benefit the community. 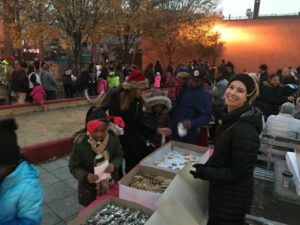 Kelly Cannon ’19 working at the Belmont Bid Christmas Event. Building relationships with the local restaurant owners and shopkeepers in the neighborhood where I live is one of the best parts of my internship. It has allowed me to become more familiar with my neighborhood and develop an appreciation for the rich culture and tradition of this century old community. Instead of only interacting with the Fordham students in the area, I now know Ritchie, who sells plants inArthur Avenue Retail Market and Dave who runs the famous Mike’s Deli. Local business owners contributed their products to the Belmont BID celebration. Another one of my favorite parts of my internship was participating in the Christmas Tree Lighting Ceremony in December. The evening brought nearly 1,000 members of the Belmont community to Ciccarone Park. Attendees gathered together to listen to Christmas carols, watch the tree lighting, eat Italian cookies, and drink hot chocolate. Santa Claus even came to the event and handed out more than 600 toys to the children of the community. Overall, I’ve enjoyed my experience at the Belmont BID, as it has enabled me to become more integrated into the area where I not only study, but live. 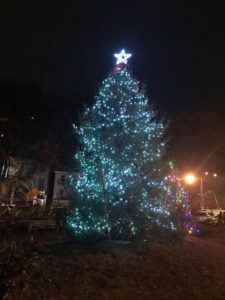 The Belmont BID Christmas Tree Lighting.